Day 2 kicked off with a train tour, then the tour that we were the most excited for: Flight of Fear, and wow it didn’t disappoint. Just being in the building is cool enough, then they started launching trains and it was outstanding to witness. It is really a spaghetti bowl of track in there. 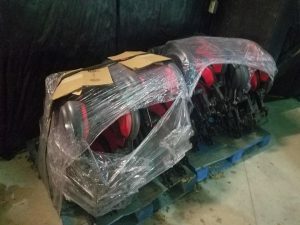 Additionally there are plenty of history sitting on the floor including the old over the head restraints and the old Scooby Doo Ghoaster Coaster. 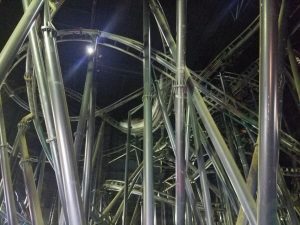 Several other members also got to ride it with the lights on, of which they said that was quite an experience and preferred lights off. Later on we had a tour of The Beast and this was a special one as well as it went what I call all the way back. With this version you go past the 2nd lift hill, over the first tunnel twice, and end up in the back before the train turns to hit the second lift hill. From this vantage point you can get alot of great photos. Normally due to weather this part of the tour is not included. At dinner we had another guest speaker, this time it was Adam House from GCI. 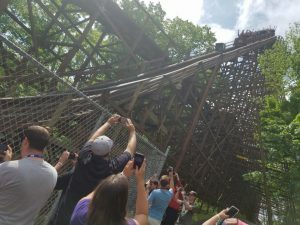 He talked about being involved with designing Mystic Timbers and other rides, as well as his background and how he got started in roller coaster design. Up next was another surprise for 10 randomly selected folks attendees, including myself: Coaster Feud. We were split into 2 teams and had to answer trivia questions about Kings Island. Now being in front of 500+ other people is pretty terrifying, imagine it being other coaster enthusiasts. While my team didnt win, the Coaster Crew had very good representation as about half of the 10 where members. After the park closed it was time for more ERT. 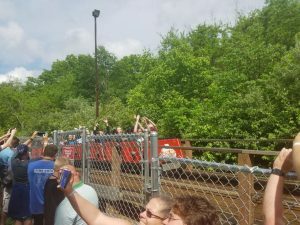 The options included The Beast, Mystic Timbers, Diamondback, and several Planet Snoopy rides: Boo Blaster, Woodstock Express, and Great Pumpkin Coaster. The line for Great Pumpkin Coaster was pretty long all night as the must ride with a kid policy was removed. As we have been going for a few years now we like to refer to this event as a family reunion, in which we see a bunch of people we know but haven’t seen in a while. Also we enjoy that alot of coaster clubs are invited as we have friends in other clubs and we always seem to meet and make new friends every year at this event. Even with the ongoing rain it was a really great event and we can’t wait till next year. We would like to again thank Don Helbig and the rest of the Kings Island staff for another great event.